How to create a Professional Resume for a government position? Download this Professional Resume Tutorial for Government applications template now! WHAT TO INCLUDE Job Information Announcement number, title and grade of the job you are applying for Personal Information Full name, mailing address (with Zip Code) Day and Evening phone numbers Email Country of Citizenship Veterans Preference Reinstatement eligibility (Proof of your career or career-conditional status may be requested) Highest Federal civilian grade held (provide job series and dates held) Desired Location(s) Work Experience Provide information for your paid and nonpaid work experience related to the job you are applying for. 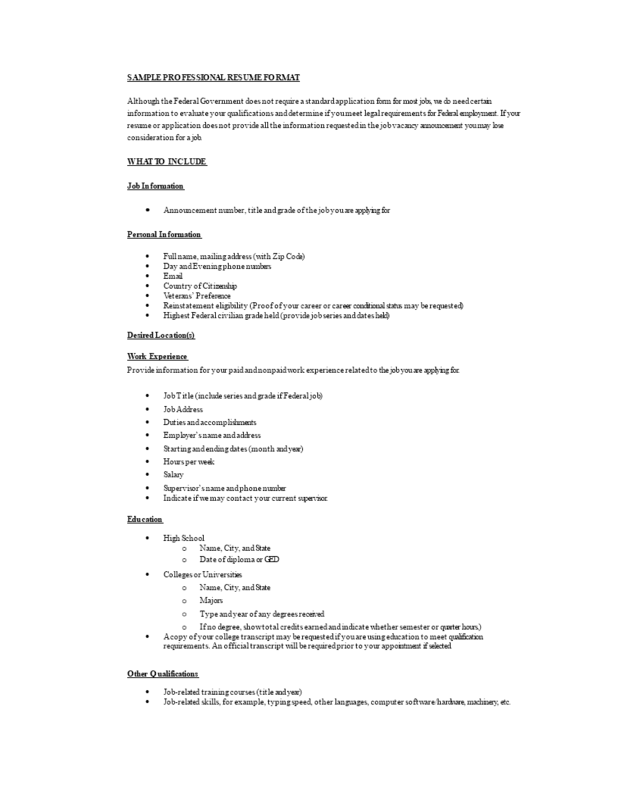 This Professional Resume Format template will grab your future employer its attention. After downloading and filling in the blanks, you can customize every detail and appearance of your resume and finish. Completing your Professional Resume Format has never been easier, and will be finished within in minutes... Download it now!